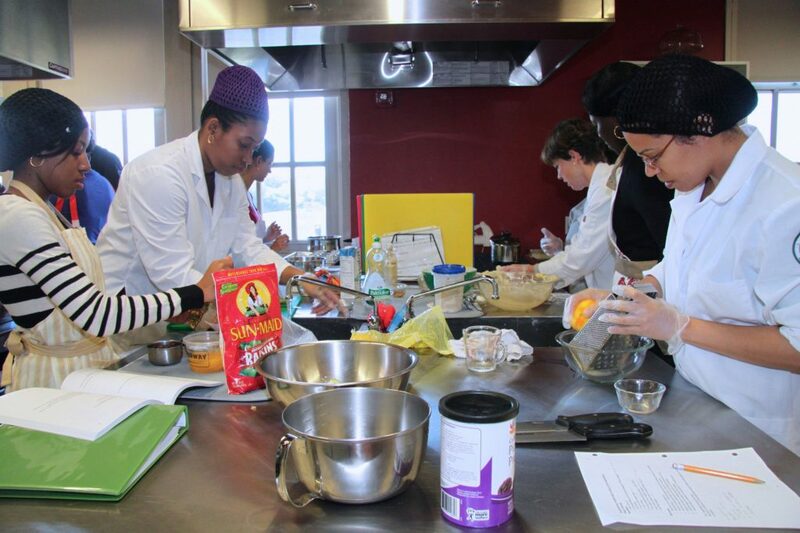 Students learn to prepare nutritious meals as part of their course work. To meet the damand of students and the job market, Lehman College is combining some of its most successful departments—Nursing; Health Sciences; Social Work; and Speech, Language, and Hearing Sciences—into a new School. Meet the people who are making it happen. On a bright fall morning, a small class of students, dressed in colorful aprons, juggled around their cutting-edge stovetops and ovens, studiously adding spices to exotic dishes. They had two and a half hours to cook a foreign meal using the technology and sleek appliances in Lehman’s new state-of the-art kitchen lab. Most of the students were undeterred by the exotic recipes and confidently mixed seasonings, testing new food preparation techniques, while a few asked Professor Mary Opfer for her expertise before hurrying back to their cooking module. Lehman’s kitchen lab and pantry was designed in 2012 to train students from the dietetics, foods, and nutrition program to cook and learn safe methods of food preparation. Its restaurant-inspired task stations can accommodate up to two-dozen students at a time. Opfer’s class on ethnic food patterns and their influences on health is a favorite among those looking to become certified dieticians. Her students alternate between lectures on the scientific principles of food preparation for different socio-cultural groups and hands-on training in the kitchen food laboratory. On that busy Friday morning, Martinez and her classmates separated into three groups, each exploring the nuances of Middle Eastern, Caribbean, or Kosher food. Martinez concocted a Caribbean chicken recipe with rice and vegetables. At the end, she sat down with her classmates to taste each other’s culinary creations for a true immersion into world cuisine. Opfer explained how they could slightly modify unhealthy recipes to improve the diets of their future clients. Lehman’s degree in dietetics, foods, and nutrition trains future dieticians to interact with clients from all walks of life. Some will choose to do community work for wellness programs, while others may join food banks, hospitals, or food pantries. But for most of them, Lehman’s kitchen is the first exposure to a professional cooking environment.